Here is a rare triple: a book (a) with a beautiful cover (imagine the title and butterflies below in sparkling gold), which (b) I got the chance to read before its release on 17 January 2008, and (c) is a mesmerising and memorable read from an interesting new voice. Well, new to me anyway, as Clement is a poet, as well as the author of a memoir and a previous novel whose title, A True Story Based on Lies, had caused me to pick it up once or twice in the bookshop. Next time I do, it will be for good. 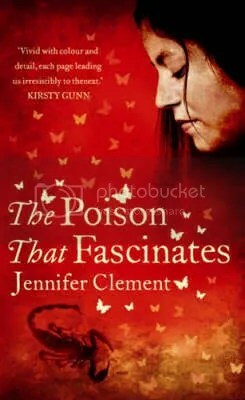 Meanwhile, The Poison that Fascinates has the mysterious, elliptical feel of a novel in translation, without ever succumbing to gaudy exoticism in its depictions of Mexico (where Clement lives). Instead, what we get is a laconic precision which generally avoids the purpleness that can characterise a poet’s prose (“In the rainy season the city becomes molten, streets turn into rivers that carry plastics, newspapers, dry willow leaves and small shards of volcanic glass”). Mother Agata is an enormous woman. Her hands are so large that she can carry most things in one hand. Dressed in her nun’s habit she looks like a colossal angel that people stand beside for shade or shelter. Children want to climb up the trunk, limb and branch of her body. The language is Wintersonian too, with its compact fluency and occasional over-reaching – but too much ambition is better than none. The Poison that Fascinates also revels in representations of womanhood: from the compassionate altruism of the mother to the far extreme of the murderess. Emily keeps notes on female murderers, an account of a different one ending each chapter. These portraits of dissociation produce some of the richest and strangest writing in the book (“She felt her eyes were inside her mouth; her nails were growing backward into her hands; a monkey bit her face; her feet were run over by a train; she heard piano music in her arms”) and each one comes at its subject from a fresh angle. I just can’t believe it when I meet someone who is so controlled by society’s rules and expectations. You know all about facts. You know all about other people’s lives and even the lives of saints. But what about your life, Emily? Have you ever done anything unexpected? Santiago’s appearance in Emily’s life will have consequences that, as the blurb promises, change her life forever, and which ultimately bring together the disparate elements of the story. The title is from Mexican composer Agustin Lara: “Woman, divine woman, / you have the poison that fascinates in your eyes,” and complements the various angles which the book takes on cultural roles and expectations of women. It becomes a fascinating puzzle of a novel, reverberating around the brain and impossible to get out of your head. Oh my now I have to get to Winterson’s book and both of the Clement books. I think I will start with them next year. I’m always interested in seeing how authors manage to inject some poetry into prose – like you say there is a right way and a wrong way. That, and the murderesses, and the women, and the cover and I think I MUST get this book. …a previous novel whose title, A True Story Based on Lies, had caused me to pick it up once or twice in the bookshop. Next time I do, it will be for good. You know, that’s just what I did. I enjoyed reading it; never once did it feel like a chore and many of the murderess parts were familiar to me through my morbid teen fascination of all things murderous. Great treatment. The hardest part, for me, was writing a review, because there was a number of angles I could have come at it from, just as Clement did with he newsclips.